The basic item of Viking-age clothing is the tunic (also called in various places a kirtle or kyrtle). The minimum kit would be just a single tunic. This can be made out of linen or wool- but linen is recommended for clothes against the skin. Of course, just a linen tunic would be less than decent. So we recommend you make some trousers as well. This is the minimum costume, and is fairly comfortable on a day with good weather- as modelled by Harald in the photo below. Also, linen is not terribly warm so a combination of a linen undertunic and a wool overtunic is recommended. Tunics are, in their simplest form, two pieces of cloth covering the front and back, with two attached sleeves. Sleeves should be tight at the wrist. More complex designs include underarm gussets on sleeves (highly recommended, to give more movement). In order to allow easier movement, the sides of tunics can be left open up to the hip ("side-split") or have triangular pieces of cloth added ("side gussets" or "side gores"). Later tunics are fully skirted, with front and side gussets. Necklines may be v-necked, oval, round or round with a keyhole split. Decoration is normally on the neckline, cuffs or bottom of the tunic. 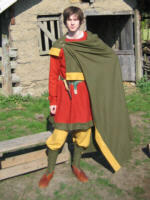 It can vary from simply using coloured thread to hem the tunics, to complex embroidery, tablet woven braid, or thin bits of differently coloured cloth (as modelled by Arinbjorn in the photo above). Undertunics and overtunics can both be cut to the same pattern. Tunics for men and dresses for women don't really differ much, except in length. Saxon male tunics tend to be cut deliberately too large, as a sign of wealth. Their tunics often reach to knee length but are then pulled up to make a belly overhang, and there are also several pictures of Saxons wearing tunics with sleeves long enough to cover their hands, pushed back to create a series of creases on their forearms. 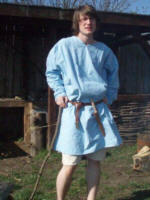 Viking male tunics seem to be a bit more conservative, with mid-thigh length tunics and sleeves that actually fit them! A later design worn in the English and Norman courts by 1066 was a long tunic, which is basically just a dress. Female dresses can be made using standard tunic designs but extended to ankle length. 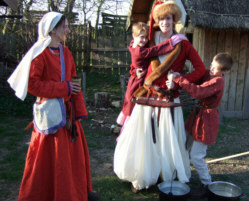 Also, there is a distinctive Viking overdress sometimes called a hangerock (hanging skirt), apron-dress, trägerock (pinafore) or smokkr (smock). The picture on the left shows several clothing styles. Wynflaed and Freya Hauksdottir are wearing typical Saxon female ankle-length dresses, and Wolfbeard Hauksson is in the standard male kit of tunic and trousers. Hauk is dressed in an early Germanic fitted wrap-around jacket, with a Rus-style hat and trousers, and with a short linen undertunic. We are currently developing a set of kirtle patterns, which will be made available here as PDFs as they are completed. Basic Kirtle #1. This kirtle has diamond-shaped underarm gussets and triangular side gores. This pattern can give a very tailored shape if you so desire. Basic Kirtle #2. This kirtle has one-piece side panels that incorporate gussets and gores. This pattern is good if you want maximum freedom of movement. 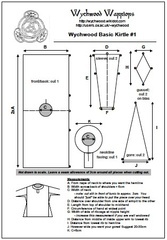 Regia Anglorum - Basic Clothing Guide - Tunics and Dresses has lots and lots of step-by-step guides and diagrams for how to manufacture tunics and dresses. The Vikings! Basic Kit Guide - Kyrtles has patterns for side-split tunics and fully gusseted tunics based on finds at Viborg and Mammen. Their Mammen tunic includes a selection of different necklines. 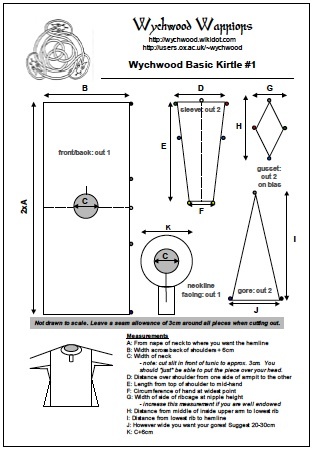 Erik Farwanderer/Kieth Nelson's Viking Age Costumes is a pdf very basic kit guide with simple easy-to-follow patterns, although the side gussets seem a bit large on their kirtle. Carolyn Priest-Dorman's Viking Tunic page is a detailed examination of the material evidence, with a bibliography and everything. Viking Women's Costume (pdf) contains dress patterns with notes on provenance and construction. How to finish the neckline of your kirtle discussion from the Vapntak board, with photos and instructions for facing a keyhole neckline. Make your own dressmaker's dummy using duct tape!